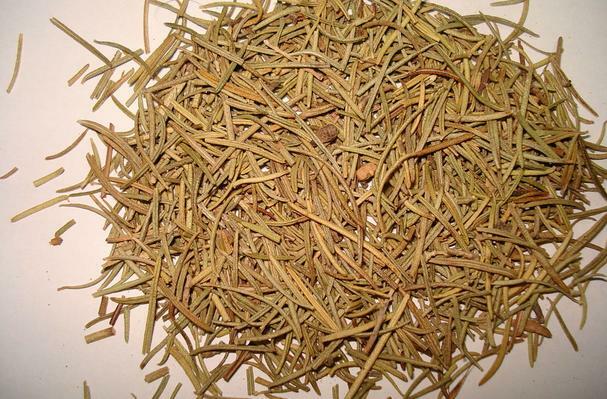 A strong-flavored and aromatic herb that grows as an evergreen shrub with the latin name Rosmarinus Officinalis . The needles, fresh or dried, are most often used to flavor meats and root vegetables. The woody stem of the rosemary plant can be used as a skewer for grilling meats or seafood. Choosing: Whole-leaf rosemary is available in fresh and dried forms. When buying fresh, look for sprigs with a clean, fresh fragrance and deep sage green color. Avoid those that are wilting, yellow or brown. Dried rosemary leaves can be found in your supermarket's spice aisle. These have a stronger, more concentrated flavor than fresh and they lose their pungency rather quickly. Dried rosemary is also sold ground, chopped or crushed. Buying: Fresh rosemary is readily available in most supermarkets throughout the entire year. However, it's almost always packaged in greater amounts than you'll need for a single meal. Freeze or dry it, or share with your neighbors. Procuring: Rosemary is difficult to grow from seed but easy to grow a start. For best results, buy a plant or get cuttings at least six inches long. It’s hardy only in zones 8-10, where the temperature does not drop below 10 degrees. It needs full sun, well drained soil, and plenty of room. Plant rosemary shrubs about six feet apart, though you won't need more than one for a family of 20 or more. Pluck off flowers to encourage more leaf growth, though this is certainly not necessary. Once established, rosemary does not transplant well. It will grow as large as a small tree if allowed enough room for its roots; otherwise it will become the size of a bush; just keep pruning it back. If you live in a colder climate, you can grow rosemary in a large, porous container and bring it indoors for the winter, placing it in near a sunny window. Right before bringing it in, spray with a bug spray. It won't hurt the plant. Then clean throughly with a soapy water bath and rinse well. You do not want to bring spiders or other numerous bugs into your home. This shrub is best grown in a large container because it needs lots of room, and the roots are prone to root rot. • To use fresh rosemary, strip the leaves and discard the stems. • To chop, gather the leaves in a tight bunch and cut across with a sharp knife. • Add fresh rosemary to frittatas and omelets. • Use crushed dried rosemary to season lamb roasts, meat stews and roasted vegetables. Or use whole sprigs; removing them when you serve the dish. • Stir finely chopped rosemary needles into tomato sauces and soups. • Season ground beef with finely chopped rosemary and bake into a meatloaf. • Purée fresh rosemary needles with olive oil to make a dipping sauce for crusty bread. Cleaning: Hold whole sprigs under a pressurized spray in the kitchen sink. Or soak or swish in lightly soapy water, rinsing thoroughly before using. The fresher your rosemary is when you buy it, the longer you'll be able to store it and keep it fresh. Fresh rosemary has soft, supple, greenish-blue leaves that aren't dry and don't fall easily off the branch. Wrap sprigs in a damp paper towel; place the herb in an open plastic bag. Store the bag in your fridge's produce drawer. Replace the paper towel with a clean freshly damp towel every few days. Dry the rosemary with a paper towel and trim off just the tip of the rosemary's cut stem (like a flower stem). Fill the drinking glass with 1 inch of clean, fresh water and rest the rosemary's stem in the water. Slide an open plastic bag over the top of the rosemary, tenting all the branches, and store the rosemary in the fridge. Change the water in the glass every few days, drying the leaves with a paper towel with each change. Throughout history, people have used rosemary for medicinal purposes. It is said that Queen Isabella (or Elizabeth) of Hungary was cured of paralysis of the joints by applying “Hungary water” made from rosemary oil and alcohol. In the 14th and 15th century rosemary branches were burned in homes to keep away the black death, or Bubonic plague. In World War II, rosemary was used in French hospitals to kill germs. History: The ancient Romans called rosemary ros marinaris; ros for dew, and marinus for the sea. They also called it the herb of remembrance. Rosemary has quite an interesting and varied history; from witches to fairies to weddings to burials - this plant seems to be truly a story full of legend and perhaps even a bit of fancy. Many of the historical references and legends surrounding rosemary have grown vague with time and the folklore of the origins of Hungary water has its own legends. Pliny (23 - 79 AD), Dioscorides (contemporary of Pliny and author of De Materia Medica a work on the use and identification of medical herbs which was the basis of medical practice for the next 1400 years), and Galin all wrote of rosemary. It was cultivated by the Spanish in the 13th century and was a popular condiment with salt meats from the 15th to 18th centuries.